New Year’s Resolutions for 2014 – Your Life. Your Hustle. 2013 was a very busy year; but we say that every year don’t we? I’ve definitely exceeded my fitness goals but failed on my dietary goals. I did not really have a weight loss goal; it was almost as if I wanted to see how much weight I could lose simply by exercising more and it’s obvious you can but now I’ve plateaued and diet is a must! Fitness is the easy part for me and the opposite can be said about diet. on getting some swim sessions in but those were too few and far between. 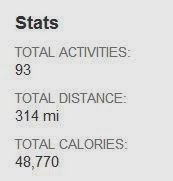 My running totals for 2012 and 2011 were both 3.1 miles as I ran a single 5K race each year. I’ve always hated running…until this year. I’ve found a grove and can run anywhere from 3-6 miles depending on how well I’ve hydrated, whether I’m sick or not, and my joints are feeling. I’ve got another 44 lbs to lose until I reach my goal weight. Once I’ve obtained 50% of that I think that running will become so much easier. Drink less coffee and more water! I’m sure there are other items I should be adding to this list but all of the above fit together very well and if I take it one day at a time with better planning and a higher level of commitment I can do it!